First, the background information. Ganda is a 10 year old brindle, female greyhound who escaped through an open gate in her yard in Zachary, LA. She got out sometime in the evening on Monday, August 9th. On Tuesday morning, I got a call from a recent adopter, who lives near us, who said her husband saw a greyhound running down Rollins Road. He tried to catch the dog, but was unsuccessful. There was some question about whether it was really a greyhound. We knew of no others in our immediate area, so we kind of dismissed it. We heard no more. On Thursday evening, I saw a sign on my way into our neighborhood for a missing greyhound. My heart sank. I got the number and called the owner and got the details and some more information on sightings. We had somewhere to go that evening in Baton Rouge, but search between 10 p.m. and about 10:45 p.m. in the areas she had been seen. Friday is when everything went into full swing. Tim got off work at noon and was able to start canvasing the area about 2 p.m. until about 4:30 p.m. I picked up a squawker on my way home, got some dinner and we started searching about 6 p.m. We brought Pierce with us and walked the Fennwood Golf Course, as several of the sightings were in that area. No luck. So we rode around a little bit and then swapped Pierce for Anna, as he was tired. We rode around the area some more and decided to try the Golf Course again. We were walking with Anna near the Clubhouse and thought we saw a dog run through some trees between two houses on the edge of the course, but there was a dog in a fence over that way, so we dismissed it as we had just seen that dog moving around. It was just hard to tell from that distance. As we were walking back to the Clubhouse, we got a call from Ganda's owner, someone at the course saw her and they were following her in a car. Tim ran to the car as Anna and I ran over to where we had seen the blur that might have been her. Nothing. Tim picked us up and we drove off to see if we could catch up. After a few more phone calls trying to pin-point where they were and what was going on, we found her. She was standing in a ditch, drinking and trying to cool off. I got out of the car with Anna and moved towards her, squatted down and called her name. She looked at us and just took off. At this point, too many people over the last several days had tried to chase her, and grab her and she was done with coming to anyone. So, I tried to follow her at a distance on foot, while several others moved around in cars. I lost sight of her in the bushes a few houses and one office from the 4-lane, divided Highway 64. This was not good. She had not been in this area at all and we so did not want her to cross the highway. Tim parked at my mom's office, which is on the corner of Newel St. and Hwy. 64. He got out and walked around the building as I caught up. A women and a little girl yelled to me and told me the dog were wer following was in the field across the highway. Great. I put Anna in the jetta, with the car on and the air running and bolted across the highway. Ganda had a head start on me. 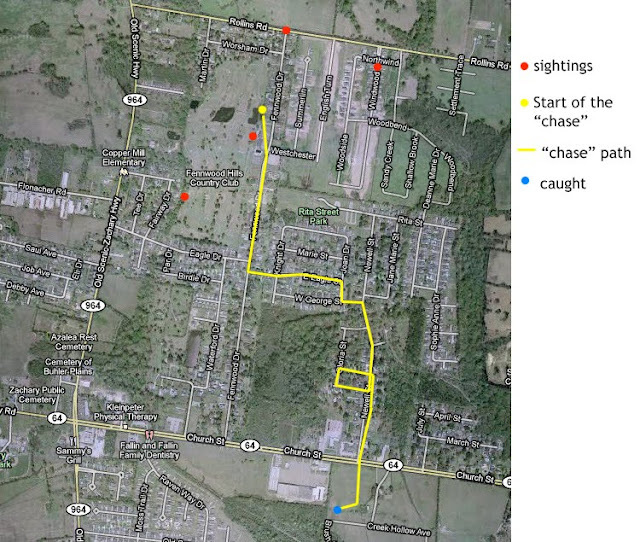 I got to the field and looked around and finally saw her, heading toward a tree line at the rear of a subdivision. I could not let her get past that tree line. I ran through the field to catch up, as she wasn't paying me any mind. I got within about 50 feet of her, stopped and called her. She looked at me, looked away and picked up the pace. The grass had now gone from knee high, to waist high, to shoulder high. There were a few tracks where a tractor had been and she was moving through them until they ended. She started to have trouble moving quickly through the high brush and was getting tired, so she started to slow, but I did not. I just kept following her, getting closer and closer. Mind you, from the time I crossed the highway until now had only been a few minutes. Finally, I was within 10 feet of her. I had a leash ready. I decided there was no way I could lasso her and if i spoke she would take off. That was not happening. As she slowed, I took bigger steps and was finally on her heels. When I got within reach of her, I just reach down and grabbed both her thighs and pulled her towards me. I started trying to talk to her as I held her. She immediately freaked out and started snapping, but I was not letting go! She bit my right arm twice, caught my shirt and scratched my chest with a tooth, and bit my arm a few more times. It was all our of fear and she barely broke the skin. Finally, I just sort of pushed her on her side. I had never let her go. I kept my left hand on her and reached over with my right and patted her and told her it was all going to be okay now and she started to relax some. I reached down and put the looped leash over her head and told her, "Come on girl. Let's go." She was panting and breathing very heavily, but she got up and came with me. In the meantime, Tim had come across the highway into the field as well and was catching up with me, coming from my right, as I caught her. I think he was probably about 50 feet away when I got her. We walked over to Tim and he carried her out of the field and across the highway, back to where we had parked at my mom's office. We immediately brought her over to a water nozzle, laid her down and drenched her with water. We needed to try and bring her temp down. We kept wetting her as we began making calls to figure out where to bring her. After about 10 minutes of wetting her down she was calming and not breathing so hard, but still panting and labored. We put her in the back of her owner's SUV and Tim hopped in with them and they took off for LSU's e-vet. I ran home, dropped off Anna, cleaned my bites, changed clothes, let our dogs our, and then met them at LSU. They checked her out, and after a few hours, a trip to Louie's for a bite to eat, a little blood work and some fluids, Ganda got to go home. I left ahead of Tim and Ganda's dad to let our dogs out at home. Then I went and picked Tim up and said a much calmer hello to Ganda. Then we went home, cleaned up and went to bed, after many hugs for our pups. That was so not how that was supposed to go. All the reading and such I had done on finesse capturing went out the window when she crossed that highway into the big field. It was now or never, and I was not going to let her get away. We had come too far. So I threw the books out the window and went for it, and it paid off. So, my arm is a little sore, and I have a few scratches, but Ganda is safe at home with her family. That is all that matters. This was one of the most difficult, frustrating and rewarding things I have ever done involving my work with greyhounds. I would hope that I never have to do that again. That no other dog gets out, but that's unlikely. It is an experience I will never forget. Please take a moment again to look at something on our website, Buckley's Wish. It really relates here. It's about a similar situation that happened right after we formed our group. I didn't care that I had never met this family before, or that this dog had not come from us, or anything like that. There was a greyhound and a family in need, and we helped them and found their dog. Ganda is now home. I helped make that happen and that makes me feel wonderful about what we do. Here's a map of where Ganda traveled, was seen, was chased and was caught. I forgot to show where she lives. It's on Jane Marie St. , so you can see how large of an area she covered. You are so right in that it doesn't matter whose dog it is. It only matters that the dog is loose, afraid and in danger. In the end, you do what you have to in order to have a happy ending. BRAVO! Holy smokes! That little girl was really on the move! Kudos to you for bringing her home. You're so right, it doesn't matter where they came from as long as they get found! Good catch! That is the scary thing about when dogs are on the run for several days.... its like the become feral and there is not amount of coaxing that convinces them to come to you. I"m so glad you were brave enough to hold onto her while she was biting you. I think most people would let go! She's a very lucky hound that you were there and also that she survived all those days loose! Your dedications to greyhounds has never faltered in my eyes and never will. However, the measures you took to make sure Ganda got home safely has brought me to tears. Sometimes we have to go against what the "rules" tell us and go with our hearts and guts!! You are proof positive of that. Thanks to YOUR tenacity --- she and her family are happy!!! Bravo!! You are an inspiration to all!